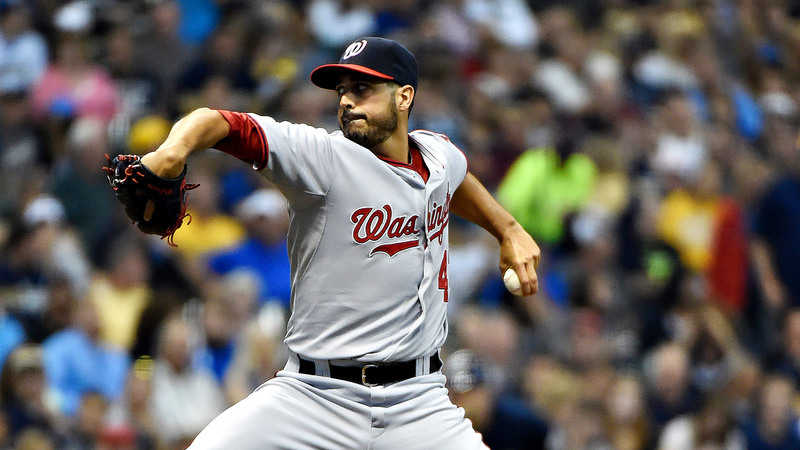 TAMPA, Fla. -- Gio Gonzalez is eager to reward the New York Yankees. The Yankees announced Wednesday they had signed the veteran left-hander to a minor league contract, hoping the two-time All-Star can help a hobbled rotation. "They gave me something I couldn't turn down," Gonzalez said. "This is a pretty great opportunity. It's impressive to be in this locker room. It really does give you a 'wow' factor when you walk in." Gonzalez said the Yankees' offer earlier this week was the lone serious one he received. "It's pretty much the only organization that saw something in me," Gonzalez said. "It's something to use as fuel. I think these guys have a really good shot this year to do something wonderful. I really want to be a part of a something like that." If added to the 40-man roster, he would get a $3 million salary while in the major leagues and the chance to earn $9 million in performance bonuses: $300,000 for each start through 30. Gonzalez, 33, will have a bullpen session Thursday and could pitch in a game Saturday. He had an 88-pitch simulated game Monday. "I told them, whenever they need me, however they need me, I'm ready to go," Gonzalez said. Manager Aaron Boone, speaking to reporters three hours away in West Palm Beach, Florida, wouldn't rule out the possibly of Gonzalez joining the rotation by the opening series. "I'd hate to say no chance," Boone said. Yankees ace Luis Severino is sidelined by right shoulder inflammation and will not be available until May at the earliest. In addition, CC Sabathia is likely to miss the first week or two as he recovers from an offseason that included knee surgery and the insertion of a stent after a blockage was found in an artery from his heart. Sabathia also must serve a five-game suspension for hitting Tampa Bay's Jesus Sucre with a pitch in his last regular-season start of 2018. Severino resumed playing catch Wednesday, making 25 throws at 60 feet. "Feels pretty normal," Severino said. "I just feel a little bit off because I've been out for two weeks." Sabathia will have his first minor league start Thursday. Masahiro Tanaka heads a rotation that includes James Paxton and J.A. Happ. Jonathan Loaisiga, Luis Cessa and Domingo German are competing for two open rotation spots. Gonzalez can opt out of his deal if he's not added to the major league roster by April 20. Gonzalez is 127-97 with a 3.69 ERA in 11 major league seasons and just finished the second option season of a contract that wound up being worth $65.5 million over seven years. "I think he's a great pitcher," Severino said. "I think he's a great guy. I see him like CC, a veteran guy that can pitch and knows the league and has been around a long time. I think it's going to be a good thing for us." ESPN's Coley Harvey and The Associated Press contributed to this report.